The 72" London rectangular-sink double vanity in white is elegantly constructed of solid hardwood. The classic beauty of the white Carrera marble countertopand contemporary style of the white cabinetry bring a sophisticated and clean look to any bathroom. Seated at the base of the rectangular ceramic under-mount sinks are chrome finish pop-up drains, designed for easy one-touch draining. Two matchingframed mirrors are included. This beautiful vanity includes four pullout drawers and two pull-down shelves, all accented with satin nickel hardware.There is an additional open storage shelf at the bottom of the vanity. The London Bathroom Vanity is designed as a centerpiece to awe and inspire the eye without sacrificing quality, functionality, or durability. 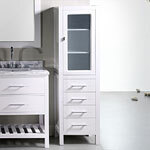 Four large drawers, two center drawers, satin nickel finish hardware.